I think you also have to take into account that it is probable that much of the gold price fluctuations have been caused by the very fact that the dollar is free-floating — or at least certain policies that are implemented due to this. When fear-mongers advise people to buy gold its often because they are anxious about current monetary policies (i.e. QE). Some further explanation may be required here. The hypothetical gold currency whose value is traced in the figure is essentially a dollar pegged to gold. Then, by definition, the price of gold in dollars does not change at all in this currency. The chart does not imply that this could not happen under a well-run gold peg. To implement a gold peg, the central bank would promise to buy and sell gold in such a way as to stabilize its price in dollars at some fixed level, say $1,000 per pound. 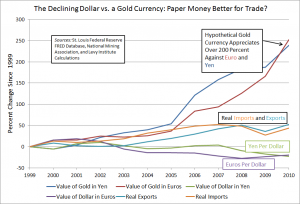 While the value of the dollar would not change in terms of gold under such a monetary-policy regime, it would continue to move relative to currencies that did not adopt a gold standard. This is shown in the figure by the upward paths of the value of the dollar against the euro and the Japanese yen. The idea is that by stabilizing the value of the dollar against the price of gold, the central bank would make it even more difficult to keep the exchange rate of the dollar against other major currencies at an appropriate level from a policy perspective–say to maintain low unemployment. 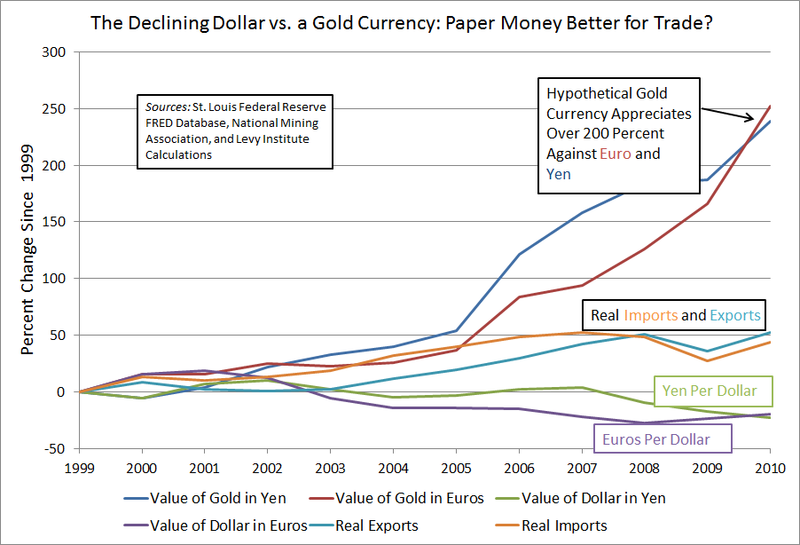 The very policies that cause concern about the strength of the dollar among proponents of a gold standard, such as quantitative easing (QE), have been of some help recently to the U.S. economy from a macroeconomic standpoint, as shown for example by the paths of real exports and imports in the figure. A gold peg would certainly strengthen the dollar and stabilize the price of gold in dollars, but in doing so, it would cause large and mostly undesirable drops in the “prices” of other currencies in dollars. This drawback of a commodity-backed currency is what the figure is meant to show, though my point is perhaps not thoroughly explained in my original post.